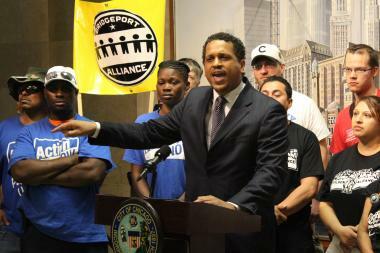 Blaine Elementary Principal Troy LaRaviere decried a CPS budget "that turns a full school day into an empty school day." LAKEVIEW — Blaine Elementary's Local School Council didn't blink an eye when Principal Troy LaRaviere published an op-ed in the Sun-Times decrying Chicago Public Schools leadership and Mayor Rahm Emanuel for squashing principals' voices. It may be uncommon for principals to speak up, but someone had to do it first, said LSC Chairman Tony Porfirio. And LaRaviere was chosen as a principal by the LSC in large part because "he will speak his mind," Porfirio said. "This is just the beginning," Porfirio said. "I think we're going to hear some of the voices that we should have been hearing for a long time." LaRaviere wrote over the weekend that the administration's interactions with principals is "often insulting" and ignores the best practices of education research. The piece, which was followed by an op-ed in Catalyst from another principal, led to more than 75 calls and emails to LaRaviere voicing support and documenting their own experiences, LaRaviere said. He started posting some of the responses on a blog. He's gotten more, but with a full-time job — "I still have a school to run" — he'll likely have to wait until weekends to update the blog, he said. "These are the voices people have to hear," LaRaviere told DNAinfo Chicago. "It's having the effect I was hoping it would have. People started speaking up about our schools and our students." Yet people in the Blaine community aren't worried about backlash at the school from CPS, Porfirio said. The LSC at Blaine spearheaded a very public coalition of LSCs against last year's cuts at the school at 1420 W. Grace St., but all interactions with CPS since then "have been great," Porfirio said. In fact, Blaine's LSC still has not approved last year's budget, which they refused to OK to protest insufficient funds. The school was allowed to continue running as if the budget had been approved. Protesting was not something Porfirio and the LSC necessarily wanted to do, he said. It's time-consuming and takes a lot of energy, but they "felt compelled" to do it, he said. Porfirio said at least one benefit has come about from speaking up: This year's budget may be as bleak as last year's, but at least the LSC received it earlier than they have in the last two years, he said. "That alone was worth the effort" of speaking up, Porfirio said. "Things haven’t been resolved, but there’s been dialogue," he said. "There’s been more dialogue than ever." Meanwhile, LaRaviere said he hopes that people in the community start talking and taking action on what needs to happen in the city for education to thrive. CPS boss Barbara Byrd-Bennett told the Sun-Times that she was surprised about the op-ed and wanted to get to the bottom of the problem, but LaRaviere said it's not a "bottom" problem — "the culprit is at the top, at the mayor's office," he said. "The people who have to hold this particular culprit responsible," he said, "are the residents of Chicago."